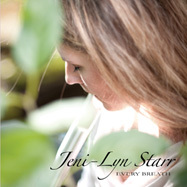 Jeni-Lyn Starr will capture your heart through her heartfelt melodies played on piano, flute, alto flute, celtic whistle, and exotic flutes. “Whether you are a new fan or an old friend, I want to say, “thanks” for stopping by. I am so excited to share my new record with you! Check it out and drop me a line — I'd love to hear your feedback! Afton Piano and Flute Lessons Now Enrolling! Every Breath at my online store.